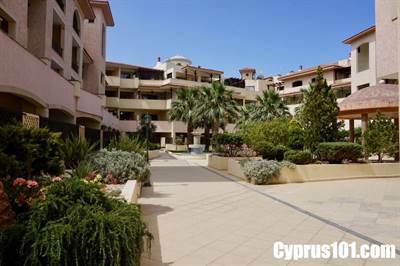 Set in a luxury Venetian style development in the centre of Kato Paphos, this impressive one bedroom luxury apartment is within easy walking distance to a great variety of shops, restaurants, architectural sites and local beaches. The property is situated on the second floor with a lift to all floors, including the underground car park. The apartment is spacious throughout with good quality modern finishes. The accommodation features an open plan living room including comfortable lounge, dining area, kitchen with breakfast bar, double size bedroom with fitted wardrobes and a family size bathroom. Sliding patio doors in both the lounge and bedroom provide easy access to a large covered balcony perfect for outdoor dining/relaxing and from here you can enjoy a fabulous view of the elegant square with fountains, decorative bridges and beautifully landscaped gardens. Ideal as a holiday home and/or rental investment this property certainly has it all – superb location on a secure prestigious development, modern finishes and fully furnished spacious accommodation. White Goods – Built-in Oven, Electric Hob, Extractor Fan, Fridge/Freezer and Washing Machine.